Even relatively harmless pop culture songs, myths, etc., can insinuate themselves into our brains with astonishing ease. Even though we know they don’t match up with what we truly believe or are just goofy-silly, we find ourselves so embarrassed at being the outlier that we go along. Sometimes, our sheepish compliance is a relatively harmless deal. But remember that whole process thing? Sometimes our compliance turns into a very big deal because of where it eventually leads us. Conforming to ideas and beliefs that don’t line up with our moral values and world view is a process. We get better and better at just giving in, convincing ourselves all the while that “no harm’s done,” as we give up who we are and what we believe. You know where I’m headed with this, don’t you? An embarrassing real-life example. A few weeks ago, we passed the fiftieth anniversary of the sappiest of all musicals, The Sound of Music. I was a high school junior when it debuted. Didn’t know myself very well then. Ate up that sugary music and plot as any giddy teenage girl would, blithely belting out the saccharine lyrics as if I truly believed them. Even convinced myself I liked cats and, get this, foods I’d never tasted. Now? I know myself better and have spent a lifetime assessing pop culture and deciding if I want to keep certain of its items or not. Mostly, I decide not to participate. I’m not so easily convinced to go along just to make life easier or please those around me who desperately want me to believe as they do. 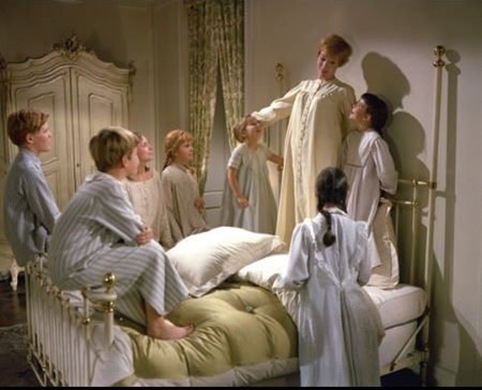 *Scroll to the bottom of this post for a refresher if you, pagan that you are, have forgotten the immortal words to this favorite of all favorite songs, made favorite by Julie Andrews. You’ll see what I mean about the syrupy silliness. Now, fifty years out, I can finally speak my mind with no worries about conforming. Here are my stand-up-and-be-counted, Ebert-and-Siskel thumbs-up-thumbs-down assessments. Are you kidding? Rain on any growing thing is a favorite thing when you live in the arid West, as I do. In our more droughty years, I’ve grown rapturous about rain on dandelions. But “raindrops on roses”? That’s just icing on the cake. We used to have a house with a yard and garden. We used to try to grow roses. And then we gave up. Out here in the West, apparently, our extremely hot and dry summers and all-over-the-map winters make roses ridiculously easy prey to insects and fungus. Having tried to raise roses and having failed miserably, I know how to appreciate a healthy rose when I see one. And one with delicate dew drops all over it? Let her rip, Julie; you’re on a roll. Or not…. I’m going to say this right out: some of us abhor kittens, and dogs, and horses – basically anything with fur that sheds. Kitten whiskers are just, well, annoying, mainly because they’re attached to something furry. When we visit you, our favorite things don’t include looking like a pet on our backsides after we leave your home. Back at home, one of our favorite things isn’t attacking our pant legs with a lint brush because the fur in your carpets hitched a ride on static electricity – straight up in the air – and Velcro-ed itself to our pant legs. We all know cats do whatever they please. If yours has the run of the house, we know she walks around on anything she pleases when you’re gone – including your kitchen counters. We know we can expect to spit out cat fur all evening, as we delicately pick our way through food prepared on those same kitchen counters. I decided to pass on the kitten whiskers – and fur – a long time ago. Yep, there’s something about a shiny copper kettle whistling on a stovetop that sings out “Welcome. Hang out awhile.” It takes me back to simpler times, slathered in good-old-days nostalgia. But the trick word here is shiny. I’ve owned a fair amount of copper goods, including a copper kettle. They require serious elbow grease with copper polish to look the way you see them in house magazines, home furnishings stores, and open-to-the-public mansions. They’re work, in other words. Kettles from other materials? Not so much. But “cheap aluminum kettles” just doesn’t have the same lyrical punch, does it? So I’m on the fence with this one. Maybe coppery aesthetics are worth the polishing. Oh, yes. For someone whose hands are almost always cold, warm mittens are lovely. Wool ones are even better (unless you’re one of those unfortunates who’s allergic to wool). I’m not so I’m in. Definitely a favorite thing, though not for the same reasons as that famous, having-second-thoughts nun. For me, it means some bright soul reversed a humble brown paper grocery bag, pressed it out, and recycled it into gift wrap. They’ve also found a secondary use for ordinary twine or string from who-knows-where, and pressed it into service as “ribbon.” Chances are, since tan on brown can be a little too understated, they’ve also found some clever tidbit to glue to the top – also recycled. Yep, my favorite things always include social responsibility, personal creativity, and a gift assembled just for me on the inside and outside. Nope. Reread Whiskers on Kittens. There’s fur involved. Oh, how I wish. But wild horses couldn’t make this celiac girl take a bite of apple strudel – or any other variant of strudel. There’s wheat involved. Now, I’m on board again. Doorbells usually mean guests, which usually signal better-than-usual fare on the dining table, except when the doorbell means USPS or UPS. But that’s usually an anticipated package – a favorite thing, too. I’ve not had the pleasure of experiencing that sleigh-bell sound, but I’d sure like to. Doesn’t it just cry out old-fashioned romance? Um. There are feathers involved, no? Too close to fur. Count me out. NOW, we’re talking. I was a pigeon-toed runner all through my early childhood, as walking took SO LONG. I fell down a lot. My ever-so-practical mother never dressed me in white – ever. Smart woman. So you see why prissy little girls in pristine white frocks and dressy satin sashes (no matter the color) just turn my crank. It was the girlhood I never had – and didn’t deserve – because I would not slow down. Depends on how long we’re talking snow, here. Snowflakes are fun – for awhile. A short while. After a longer while, not so much: there’s backbreaking shoveling involved. Oh, yes. By the time Spring (all three weeks of it) appears, I’m so over Winter I don’t even think to say goodbye. Spring brings the promise of green, and green is one of my favorite colors. Not going along with pop culture won’t get you killed. As you can see, after skewering one of the most favorite songs from one of the most popular of all American musicals during the last fifty years, I’m still standing. No lightning. No unhappy voice from the heavens. No hate mail – yet. Yes, I may be shunned by the uber-trendy when I buck the latest PC trend or (more likely) disinvited by my animal-loving friends, BUT NOT KILLED. I’m living proof that it’s okay to decide not to participate. It’s okay to decide you really don’t like ______ even though everyone else raves about it. And yes, I know I’ve chosen a safe, wimpy example. I could’ve called out the words to some current pop-culture songs that are alarmingly toxic to the soul. Baby steps. Baby steps. It’s easier to start by taking a stand on the little things. Gain some momentum and get comfortable with how it feels to buck pop culture. Keep assessing it in light of your thoughtfully chosen values and carefully examined beliefs. Keep deciding not to conform. The soul-toxic stuff? You’ll be strong enough to smack it down sooner than you think. Pay attention: not conforming to pop culture won’t get you killed. Au contraire: it just might save your life. 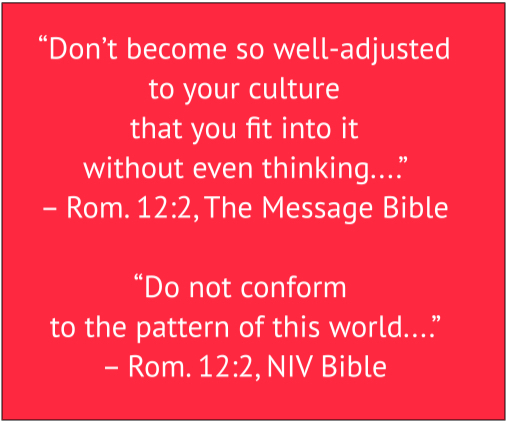 Conforming to our culture is dangerous. A yo-yo-ing slacker doing what he does best. Do you make a habit in your personal or business life of giving people a second chance? Good for you. Giving second chances makes the world a better place. And who of us isn’t in desperate need of a second chance now and then? Okay, a whole lot of nows and thens. But you know too much of a good thing is too much, don’t you? In a spirit of tenacious good will, do you routinely offer second chances? How about 22nd chances? So how’s that working out for you? I feel your pain: it hasn’t worked out well for me either. Now that I’m well past the last unfortunate episode that first prompted this rant, I’ve tried to edit this post so that it has a modicum of civility. You may disagree when we’re done. If so, post a tactful comment. Never knowingly ask people to do things who’ve proved repeatedly to be people who don’t follow through. When we persist in well-meaning 22nd chances, we “make work” for ourselves – and others. More often than not, that work has to be done at the last minute, in seat-of-the-pants style with disappointing outcomes. That’s because slackers typically wait till the last minute to ‘fess up that they haven’t done what you asked. The more slacker-ly among them don’t even tell you before they jump ship: they just go AWOL and leave you high and dry. They turn what could’ve been an easily doable project into a rip-off-the-Band-Aid kind of project. unnecessarily stressful and shoddy work)? Ah, let me count the ways. And I’ll bet you can, too. 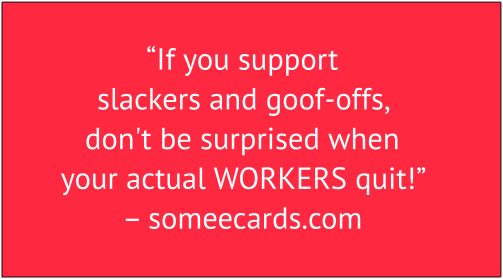 Why not add a comment with your favorite slacker characteristic to supplement my deceptively short list of telltale slacker traits? Yes, you are depriving them of the work in question, with all its rewards, learning and earning potential, and benefits, but they marginalized themselves first. You’re merely assessing their past history of outstanding slacker performance. Therefore, they are depriving themselves. No one’s paying you to make foolish decisions. Putting a habitual slacker in charge of anything which involves your own job (your ability to make a living) and work reputation (your ability to keep the job to make a living) is foolish. Putting the slothful in charge of anything important to your organization usually goes beyond foolish; it can be downright dangerous. Lest there be some misunderstanding, LET ME BE CLEAR: this is not a blog post about forgiveness. It’s a post about people who rarely, if ever, do what they promise to do for the good of the order. Continuing to give people tasks who routinely don’t complete those tasks is one thing. Continuing to forgive people who hurt you is something else. Jesus commands us to practice perpetual, unending forgiveness – an attitude of the heart. You’d be hard-pressed, however, to find anything in the Bible that commands us to act foolishly, oh say, like relying on known slackers over and over and over. In fact, Proverbs is filled with all sorts of admonitions against such foolish behavior: check it out. I wish I’d said this. It’s soooo very spot on!